The iPhone has so much potential. The cell phone market is ripe for change. Can the iPhone do it? The definition of a smartphone, according to Wikipedia: “A smartphone is a mobile phone offering advanced capabilities beyond a typical mobile phone, often with PC-like functionality.” The smartphone market is growing larger and larger everyday- dating back to 2001, when the first BlackBerry was released. 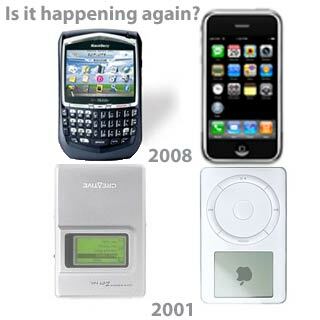 However, since their inception almost 8 years ago, the technology and software behind these devices (BlackBerry, Treo, etc) have changed little. That was, until last year. With the introduction of the iPhone in January 2007, the technology world was suddenly mesmerized with what is still referred to as the “most anticipated cell phone”. The iPhone broke the mold of all other ‘traditional’ cell phones in many ways- it’s touch interface, slick integration of 3 devices into one, core software being OS X- not to mention that Apple designed alone- there was no influence from the carrier. While the iPhone’s concept is great, execution was good and has proved midly successful, we are only seeing the foundation laid by Apple. Until June 2008, the iPhone has been under the sole control of Apple. In a situation strikingly similar to the original Macintosh, the iPhone is innovative and has revolutionized the cell phone market already like the Macintosh. Now that Apple has laid the groundwork, it is time for the developers to step in and give the world another reason to buy an iPhone, to build the metaphorical house. Unfortunately (or fortunately), the Macintosh never saw this stage in 1984- it was crippled by a limited amount of 3rd party software. The iPhone is in entirely different situation. While developers were initally scared by the GUI in the Macintosh, developers have been begging to develop for the iPhone since it’s introduction! Last week, developers were finally given the opportunity to start writing their app’s for the iPhone- not to mention Apple’s commitment to add enterprise features! This announcement was met with very positive reaction from the technology community. There is no question: the iPhone is headed in a really great direction. Not only strengthening the iPhone platform, Apple is getting ready to compete with the biggest smartphone maker- RIM. Just as it did with it’s iPod years ago, Apple is slowly beginning to dominate the smartphone market and with the latest trajectories, could leave its competitors in the dust. The more I think about it, RIM and its BlackBerry devices are almost reminiscent of Creative’s music players 7 years ago compared to the iPod. And after last weeks announcement, all the sudden the iPhone is a full-blown competitor to RIM’s BlackBerry. The iPhone may become the next iPod for cell phones. Will the competitors see it coming this time around?